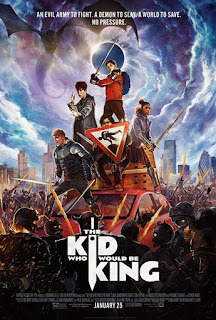 Read Steve's review of The Kid Who Would Be King. Old school magic meets the modern world in the epic adventure THE KID WHO WOULD BE KING. Alex (Ashbourne Serkis) thinks he’s just another nobody, until he stumbles upon the mythical Sword in the Stone, Excalibur. Now, he must unite his friends and enemies into a band of knights and, together with the legendary wizard Merlin (Stewart), take on the wicked enchantress Morgana (Ferguson). With the future at stake, Alex must become the great leader he never dreamed he could be. The Kid Who Would Be King is in theaters on January 25th, 2019. 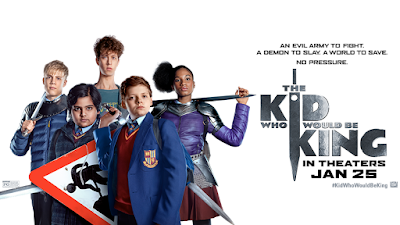 The Kid Who Would Be King is a modern re-imagination of the legend of Arthur including the knights of his round table, Merlin, the sword of Excalibur and evil sorceress Morgana. While the film does a great job of bringing the story into present day Britain, the bones of the legend remain in tact. While most of the child actors in the film might seem new to you, the like of Patrick Stewart, playing the older version of Merlin, and Rebecca Ferguson, playing Morgana, lend their talents to the movie as well. This was definitely a kids movie, but that did not make it unwatchable for adults. It had a lot of light and funny moments, but it also had a lot of heart. You could tell that moral themes and lessons were intently woven through the entire plot. I am not sure that it would necessarily be a must-see film for adults who don't have children in the age range this film is targeting, which I would say is 13 and under. The acting from both the child and adult actors was good, some parts felt cheesy and over-acted, but overall it kept me entertained from start to finish. I felt as though the plot line concerning Morgana, while the main antagonist of the film, just didn't really land for me. Her scenes felt stoic and over-acted which made it stand out in contrast from the tone of the rest of the film. The marketing for the movie tried to bill it as something akin to harry potter, but I have to say I don't think it even came close. I would recommend if you do plan to see it, keep your expectations lower, otherwise you will be sorely disappointed.